Excuses Salespeople Make. Are You Making Too Many? Nothing out of the ordinary for my travel schedule. I’ve done far more travel in a day without problems. Due to the locations and times, I elected to fly out of Logan to Fort Lauderdale. Again, sounds simple, but then came the onslaught of air-traffic delays due to weather, not only in Boston, but also in Florida and all points in between. Despite having what I thought were options, nothing was going to alter the weather. After doing the board/deplane/re-board dance and watching flights get cancelled and rental car reservations disappear, I finally arrived at my hotel in Stuart. Let’s just say I arrived so late or so early that the hotel didn’t even charge me for the night, something about only having 75 minutes to sleep before having to get up, shower, consume caffeine, and put a smile on my face for my 8 AM client meeting. As the trip continued to collapse and go from a 4-hour trip to a 14-hour ordeal, it would have been easy to say it’s not going to happen and reschedule. Being asked to go into an all-day meeting on less than two hours of sleep would qualify as an excuse. But wait — are travel delays and a lack of sleep a valid cop out or is it something we as salespeople should be prepared to deal with? I’ll admit it’s an individual call, dependent on any number of factors, but here’s the deal as I saw it. As a salesperson, I can’t make excuses and I have to be in control of my situation. Blame is not an option! Lousy salespeople are quick to make excuses. The lame salesperson would have bailed on the trip upon seeing the first sign of bad weather at Logan. Oh, let’s not forget the lousy salesperson would them determine they would need an overpriced dinner charged to their expense account to deal with their cancelled trip and the “agony” of cancelling. The average salesperson would have opted to find a hotel at FLL, grab a night’s sleep and look to cut the meeting from a full day to something less. I’m not putting myself on a pedestal, but merely making a point. 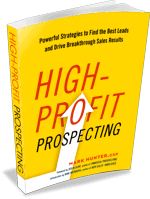 If we want to be seen as a high-performing salesperson and a sales leader, then we have to act like one. Making excuses is not an option. It’s our job to always have contingency plans, and when they don’t work, to be able to still make it happen. Sales is not about having excuses. Sales is about overcoming obstacles to put the customer first. Make this a “no excuses allowed” year! PrevPreviousDo You Believe In Yourself?